• Dogs Love The Taste Of Purebites! Dogs love the taste of purebites!. 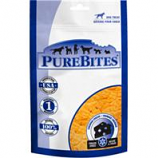 Only one ingredient: 100 percent natural and pure us made cheddar cheese.. High in protein and a great source of calcium.. Freeze-dried to preserve the natural nutrition and freshness of cheddar cheese.. .
• Cats Love The Taste Of Purebites!